On October 26, 2017, U.S. President Donald Trump announced that his Administration was fighting the opioid crisis by declaring a national public health emergency under federal law. This declaration from the highest office in the country is a long time coming. Addiction to opioids, whether prescription medication or heroin, have caused serious social and economic impacts. For instance, heroin overdoses have quadrupled since 2002 with just 50,000 opioid-related deaths in 2017. In addition, the economic impact of opioid addiction cost the United States $504 billion. And still, many opioid epidemic solutions have fallen short. However, some innovative community solutions for opioid addiction, such as peer to peer video counseling, have shown promise. Opioids are highly addictive and difficult for heavy users to overcome. Around 197 people die every day from opioid overdoses in the United States. Sadly, many people have few resources available to help in their time of need. Fighting the opioid crisis requires the community to establish an emotional connection with those struggling with addiction. While there is no one cure-all for opioid addiction, medically assisted detox, professional psychiatric therapy, or nutritional support can mitigate the physical effects of opioid addiction. Some other opioid epidemic solutions, such as addiction hotlines, can provide support, local resources, and additional information on recovery. However, opioid addiction is a lonely experience. Unfortunately, the faceless voice on the other end of an addiction hotline limits the overall effectiveness of this treatment method. However, community solutions for opioid addiction, like peer to peer video counseling, can help patients better comprehend their addictions and embrace healthier lifestyles. Opioid epidemic solutions facilitated by former addicts has become an effective method of helping others who are struggling with addition. These community solutions for opioid addiction are so successful that hospitals have brought peer specialists into emergency rooms to deal with overdose cases. Taking it one step further, some peer specialists offer their services through video chat technology. 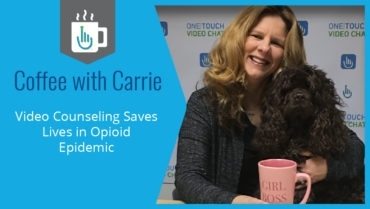 Fighting the opioid crisis through peer to peer video counseling offers recovering addicts remote access to a peer specialist. This is particularly helpful in the rural areas where certified peer specialists can be in short supply. Transportation barriers in rural areas are not an issue when all you need is an internet connection, laptop, and webcam. In addition, younger generations may shy away from traditional addiction hotlines but are already familiar with video chat technology. This gives peer to peer video counseling a competitive advantage in the fight against the opioid epidemic. Recovering addicts can have a remote, face to face conversation with a person with an actual lived-experience that mirrors their own. Opioid deaths have surged nationwide as many lives continue to spiral out of control. Community solutions for opioid addiction offer a fresh perspective on this problem. Download our Opioid Epidemic in the U.S. infographic the lean more about the national crisis and innovative opioid epidemic solutions.